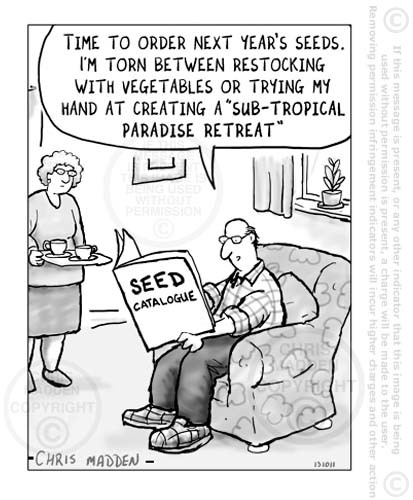 The woman in the cartoon is a keen organic gardener – and her husband is a lazy waste of space. The gardener complaining that all of the fruit on a fruit tree arrives at once. A cartoon about fruit gardening, vegetable gardens, harvesting fruit, pear trees, garden fruit, allotment gardening, autumn gardens, fall gardening, fruit picking. Cartoon showing a gardener painting halloween lantern faces onto his prize pumpkins. He is painting the halloween faces onto the pumpkins in an attempt to scare cats away so that they don’t damage his garden (such as by using his freshly dug seed beds as a cat toilet). Windfalls are normally associated with apples and apple trees, however I’ve used pears in my cartoon because they are a more interesting and recognisable shape. A joke showing a vegetable garden or allotment full of weeds. A cartoon about weed control, invasive species, organic gardening, pests. A man using a ladder to reach the ripe fruit at the top of a pear tree. A humorous illustration about health and safety, how to use ladders, safety in the garden. A man using a cherry picker or aerial work platform to reach the fruit at the top of a pear tree. A humorous comment on some people’s tendency to use technology or equipment that has a higher spec than is necessary for the task in hand. Similar to the concept of using a sledgehammer to crack a walnut. Cartoon showing children walking under an apple tree laden with apples, and not being interested in picking any of them because they are too engrossed in modern technological devices such as cell phones or other hand held electronic devices.